Yaheetech Dipping Station is a new heavy duty product on the market and offers a good solution for those that wish to purchase a freestanding dip stand for their home gym to do triceps (the first thing that comes to mind with a dip station), biceps and a range of other challenging upper body exercises that involve deltoid muscles, triceps and shoulders by using their own body weight. It looks nice with the black powder coated finish and a modern design and as a very durable metal- iron product with a body made from steel bars of 2 x 2 inch size, it can carry people of up to 500 pounds in weight (you may see the additional support underneath the arms on the photos and this gives it that very robust feel when you’re doing your exercises on it). 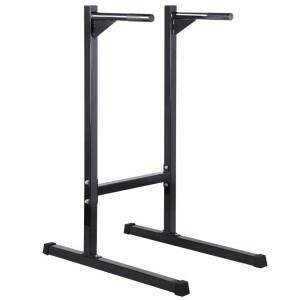 Yaheetech Dipping Stand weighs 40 pounds and the measurements for the whole dip station is 39.4 x 25.5 x 53.1 inches- has a compact size and shouldn’t occupy much space at all in your workout area or living room (it actually needs less space than most other fitness equipment as it is more of an upright thing with a small footprint), has the hand grips of very thick 1.5 inch diameter and 15.7 inch long. It is quite simple to assemble with the instructions provided (and you can probably work it out easily yourself without looking at the user manual- is quite easy as you can see on the photos). Although it is designed for home use, surely has that professional feel and quality and can be used by just about anyone that wants to do their arm workouts with its special angled design and is suitable for use by also very tall and/or very heavy adults. You should not worry about slipping while you’re exercising on it either, as the bottom section have the knurled anti-slip floor protectors. You will be using your own body weight when you are working out- doing a variety of upper body exercises and will not have to use any free weights which come with a certain degree of nuisance and risk. 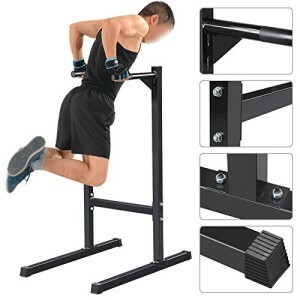 It makes a nice, simple but very functional and durable addition to anyone’s home gym and is offered at a reasonable price currently- at the time of this review on Amazon.com.